My guest on today's episode, Jessica, is from Toronto where she is a professional photographer. Her daughter is 9 and her son is 6. This was a first time in France for the kids who are in French immersion school at home. Jessica hadn't been in France since 2000 when she was an exchange student in Montpellier, so a lot of things had changed in the meantime. Their trip took place in Oct 2018. They stayed at AirBnB most of the time. That worked out well because they needed 2 rooms and having a kitchen is always wonderful when traveling with children. See the complete list the specific properties where they stayed in the Guest Notes (blue button below). 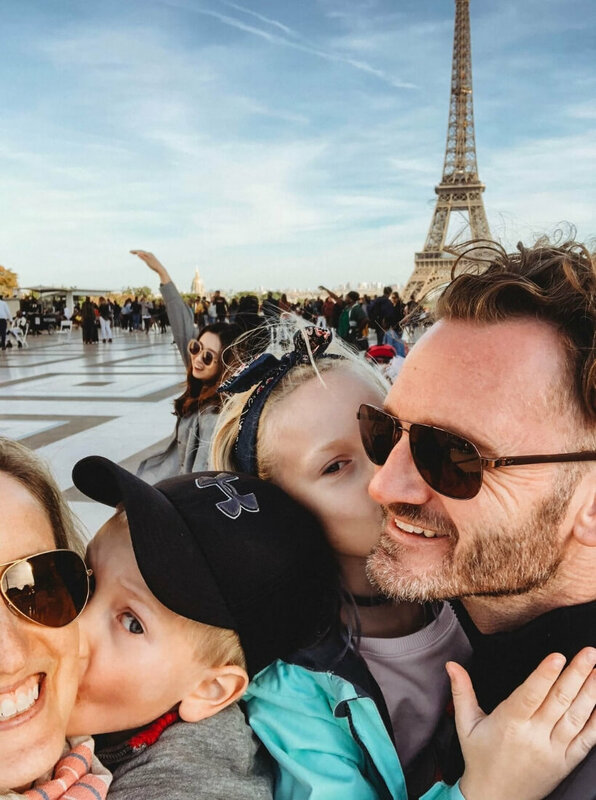 What they enjoyed most overall in Paris was walking around, stopping at parks, riding carousels, using playgrounds, and enjoying every-day life in the City of Light. They also loved to stay on rue Montorgueil, a wonderful pedestrian street in Paris. It's the small things, you know? The Eiffel Tower security plexiglass is now up. Remember, if you don't buy your tickets in advance for the Eiffel Tower, you will have to go through THREE lines: security line first, then ticket line, then elevator line. You can go under the Eiffel Tower without paying, but you have to go through the security line first. One hack to not wait so long at the Eiffel Tower is to check the closing time for the day you're there and go an hour or 90 minutes before closing time. This works even in the summer. If you're there so late that there aren't any RER or Metro any more, you can always count on the night bus called Noctilien in Paris. Walk Down to the First Level of the Eiffel Tower! There are no lines to use the bathroom on the first level of the Eiffel Tower and those bathroom are usually a lot cleaner! This is where the kids can enjoy the glass floor, there is room to sit down, you can watch a short movie about the building of the tower. Also, when you walk down you experience the stairs of the Eiffel Tower up-close and personal without having much of a workout. The first level is worth a stop! Montpellier is a very walk-able city and has a lovely downtown. Exploring the streets and hidden plaza is wonderful there! Montpellier also gets a lot of sun (anybody who looks at weather averages can see that!) but what I didn't know is that it also has wonderful toy stores. Wonderful for a family with young kids! 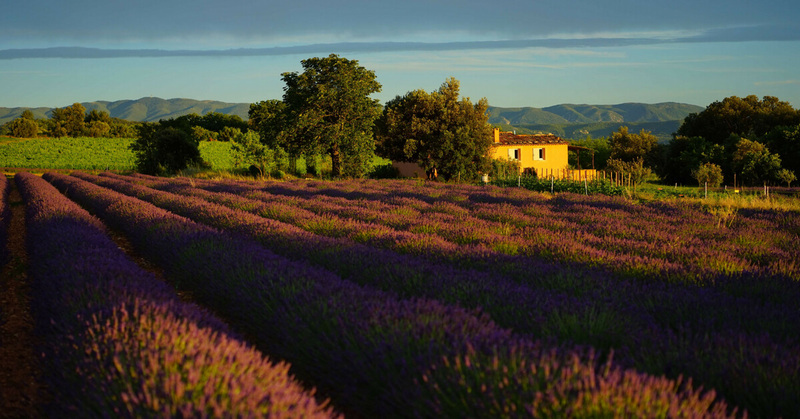 From Montpellier they rented a car and drove to Provence. Their favorites there were running around Roussillon, the French red-rock country AND Accrobranches where they got to do dare-devil stuff like climbing trees and doing zip lines. Le Lavandou was also a great find. They hiked Le Sentier du Littoral and loved it! There are hikes all over the place along the Meditarranean, you should look them up! To find one near where you are search "chemin du littoral" in Google. The had only planned for 2 days there and they wish they had more because it was one of their favorite places this whole trip. They loved renting little boats on the lake, the scenery, going up to a ski resort called Semnoz. They would spend more time in Annecy. That could have been achieved by spending one fewer days in Montpellier and/or Le Lavandou. 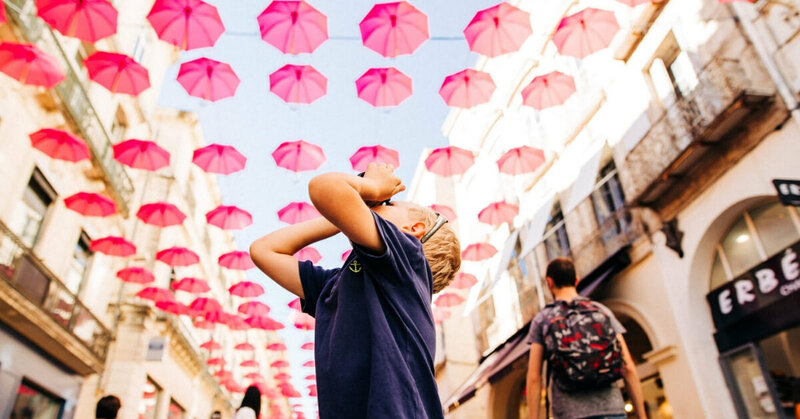 Is It a Good Idea to Bring the Kids to France? France is a wonderful family vacation. Don't assume that just because your kids don't even like walking through a supermarket at home they'll complain in France. In France everything is different! Every day is a new day!They will probably really enjoy little treats like crêpes or tarte au citron, use those motivators to get them exploring. In France they also don't have their PlayStation or whatever screen entertainment they usually keep themselves busy with. That is a HUGE change for kids! Be aware that they are probably going through withdrawals! Staying at AirBnB is good because you can cook foods they like. Don't plan too much, be prepared to take it easy. French restaurants can't always accommodate kids the way you are used to in the US. French kids are used to eating what's in front of them even if they're not happy about it. When traveling with kids it's good to know about a few possibilities for activities every day and then play it by ear depending on how everybody feels and the weather, etc. But do have suggestions for activities every day! If your kids have a tendency to get car sick, make a plan for that because we have a lot of winding roads in France! Part of the charm of France is that we don't have straight roads that cut through the landscape, but it can become a problem. What About Driving in France? Driving in France is great. There was a mix-up at the car rental company and they ended up giving them an automatic for the same price as a manual, which worked out great. Be sure to book your car rental in advance and get a vehicle that will fit your needs! Don't assume they'll have lots of cars on the lot and lots for you to choose from. If using a GPS (and you should!) you will have to ignore it sometimes when it tries to save you 200 meters of driving by taking you on a ridiculously narrow "shortcut". Generally speaking, if you're seeing signs for your destination, follow the road signs. Road signs will take you the safest way whereas GPS will take you the shortest way. You can also work with the preferences in your GPS settings to make this less likely to happen. Paris is full of pleasant neighborhoods. Make sure you stay in one of them so you don't have to spend so much of your day getting to the most wonderful areas. If you're going to take the train, bring your own food on. They have a restaurant car on the TGV, but selection is limited and it's expensive. The TGV between Paris and Montpellier takes less time than flying between Paris and Montpellier and a train is also a lot more comfortable than a plane. Book your TGV tickets in advance, prices go up as the date gets closer!